Whether you’re at the main campus or the downtown one, you’ll find a range of excellent dining options for great value prepared by the chefs-to-be. 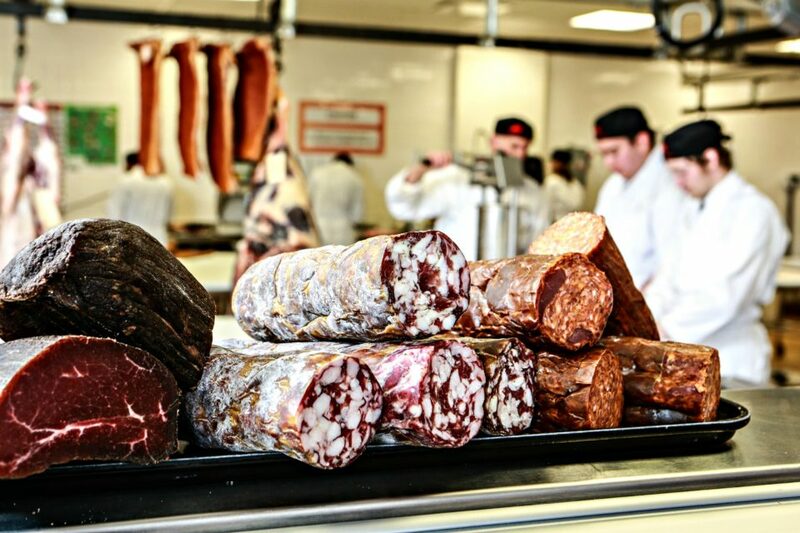 Reap the benefits of SAIT's butchery program by checking out their on-campus deli counter for cured meats, fresh cuts of pork, beef and more. Photos by Dan Clapson. Having a top-tier culinary school in a city, like we have right here with SAIT, is a wonderful thing for many reasons. First and foremost, it’s beneficial to have well-educated and well-trained young chefs graduating from the Culinary Arts or Pastry Arts programs and then joining kitchen teams around town. Second, the tasty by-products of all that learning and practicing have to be eaten by someone, and that someone can be you if you know where to go for these skillfully prepared foods for great value. Here are all of the ways that you can enjoy the from-scratch bounty produced by SAIT’s chefs-in-training on campus and downtown. It’s not often we’d recommend eating at a cafeteria over the lunch hour (that’s so high school), but 4 Nines is leaps and bounds above tepid hot dogs and lukewarm pizza slices sitting under a heat lamp as it operates as a living classroom for professional cooking students. With a breakfast service from 7:30 to 9:45 a.m. and lunch 10:45 a.m. to 1:30 p.m., you can expect anything from freshly baked quiches in the morning, simple sandwiches assembled with in-house baked bread, roast chicken meals and more. Most meals ring in at $10 or less. Only open for business on Thursdays, the lower level “butcher shop” is fully run by students during the fall and winter semesters. Here, you can buy an array of cured and smoked meats like bacon, salami, bresaola and more. In addition to that, the butchers-to-be behind the counter slice up all sorts of proteins from chicken to beef and are always up for some custom cutting should you be looking for something unique. If you can’t make time to swing by on a Thursday, you can still find reasonably priced packaged meats at The Market Place at the downtown campus. The main jewel in SAIT’s cooking crown comes in the form of this relatively formal dining room in the John Ware Building on the main campus, and puts its students’ fine dining skills to the test on a nightly basis. Sit down here and watch as students eagerly buzz around the room, taking orders and making drinks under the watchful eye of instructor Patti Koyich. In the kitchen, teams of students will be led from a variety of talented instructors like former Catch executive chef Hayato Okamitsu where they prepare a progressive chef’s tasting menu for patrons. The menu is always evolving here, and the point is for the students to get really creative. As such, you can expect touches of molecular gastronomy – you know, dots of this, powders of that, and spheres full of flavour. Another major perk to dining here is that you can get a two-ounce classic cocktail like an Old Fashioned or a gin martini for just $7. If that’s not a steal of a deal, I’m not sure what is. Reservations can be made here up until October, 31st. The newest outlet for SAIT students to get real-time cooking experience opened up about three years ago in the Stephen Avenue mall, and has been a popular place for downtown workers to grab a bite since day one. Come by between 7 a.m. and 10 a.m. for made-to-order omelettes and breakfast sandwiches (only $6 apiece), coffee and freshly made pastries. Over the lunch hour (served between 11 a.m. to 1 p.m.) the slick, open kitchen concept shows students working at a variety of stations handling anything from rotisserie meats, pastas, sandwiches and more. Don’t let the long lunch line-ups scare you, this set-up was designed efficiently so you can get in and out quickly. Beautifully decorated cakes, loaves of sourdough bread and ready-to-go meals are just a handful of the edibles you’ll find as you stroll around SAIT’s Market Place downtown. As aforementioned, there is an array of packaged proteins (beef, salmon, etc.) to purchase here, as well as a mix of different student-made sauces and preserves to compliment whatever you end up searing or roasting for dinner at home.